The Two Seasons Hotel and Apartments is the ultimate choice for business meetings, corporate functions and private events. Set in an ideal location on the Sheik Zayed Road in the centre of the Dubai business district, our Dubai business hotel is easily accessible from both Dubai airports (30 minutes) and is right next to the metro station. 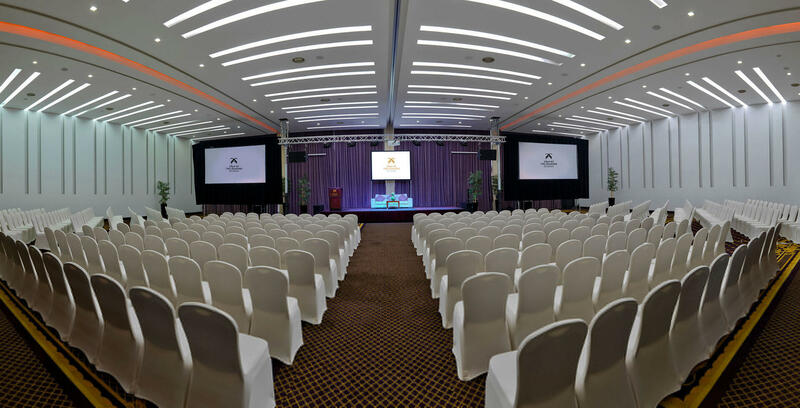 Boasting more than 1,845 sqm of flexible meeting space, Two Seasons Hotel & Apartments can host various events from small meetings to larger conferences and weddings. The meeting facilities occupy 6 levels from P4 to P6, 8th floor, 40th floor and 41st floor, with all levels having acces to elevators and levels until 6th floor having direct access to car park. The property’s Dalma Ballroom can accommodate up to 600 guests. It is located on P4 level, and has pre-function area, terrace and private entrance from outside. The remaining meeting rooms are scattered across 6 levels. If you’re considering hosting a small business meeting, conference, event or even your wedding we´d be delighted to talk to you about your needs. Our professional and specially trained staff will work with you to provide an unforgettable event for all your guests.